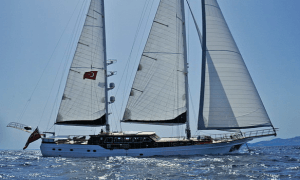 Luxury Yacht Charter Turkey with Indigo Bay. 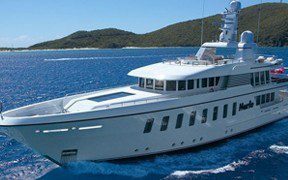 We offer a fantastic selection of outstanding charter yachts in Turkey – ranging from ultra spacious luxury Turkish Gulets to fabulous motor yachts, catamarans and sailing yachts . Cruise the Turquoise Coast in style. A land of deeply layered cultures and miles of unspoiled coastline fringing brilliant sapphire waters, Turkey is still a place to discover. It is truly magical with crystal seas and dancing dolphins, peaceful bays and vibrant bazaars. Wake to the haunting sound of the muezzin’s call to prayer as morning fills the sky and watch turtles glide beneath you as you enjoy a true Turkish breakfast – a feast of the freshest fruits and other treats. Turkish cuisine is regarded by gourmands as being one of the finest in the world. By day you can snorkel over the ruins of a Byzantine monastery, explore tiny coves by kayak, long lazy lunch under the awning or visit ancient monuments ashore. By night why not meander through ancient streets draped in bougainvilleas where treasures fill the cool, deep shops walled with rich carpets; or just dine under the stars in your private heaven. 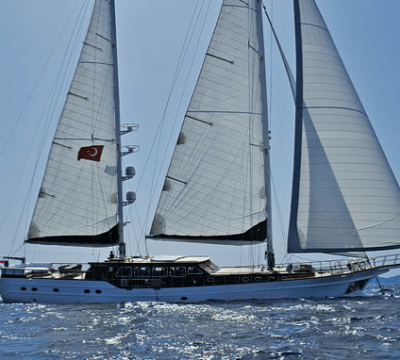 Turkey has more to offer than is possible to mention here, but our uncompromising fleet of yachts have unparalleled knowledge of these waters and will guide you to discover the riches you seek. 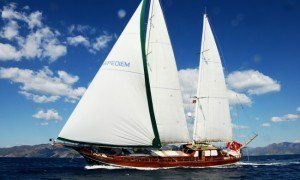 Bodrum, Marmaris, Gocek and Fetiyhe are our main ports with easy airport access and cruises sailing the coastline, islands and coves between them. 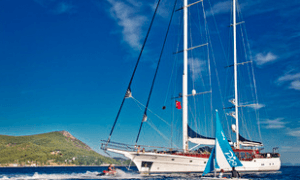 Luxury Yacht Charter Turkey starting in Marmaris. Board your yacht in the colorful market town of Marmaris and enjoy a welcome drink and lunch on board while chatting with your captain about your upcoming cruise. 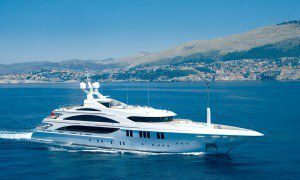 Time for a swim and explore the bazaar set among white walls and tumbling bouganvillia before dinner on the aft deck. Marmaris – Ekincik. 2 hours sailing. After a delicious fresh fruit breakfast set sail for a two hour cruise to Ekincik – the village at the mouth of the Dalyan River. Take a small riverboat upriver to ancient Caunos to see the remains of a Byzantine church, a Roman bathhouse, theatre and Agora. Further up you will find the spectacular sight of intricate Lycian rock tombs carved into the cliffs in 400 BC. 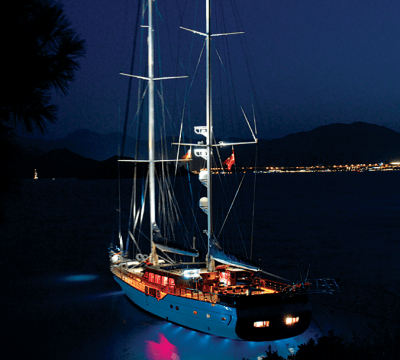 Then, back to the yacht for water sports and a relaxing evening at anchor. Dinner under the stars or at the local My Marina restaurant? Ekincik – Agalimani. A wonderful 3 1/2 hour sail to Agalimani and it’s crystal waters. 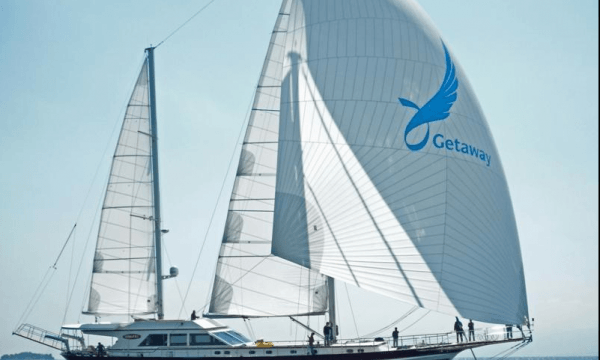 Swim with turtles and relax while the crew prepares your lunch. 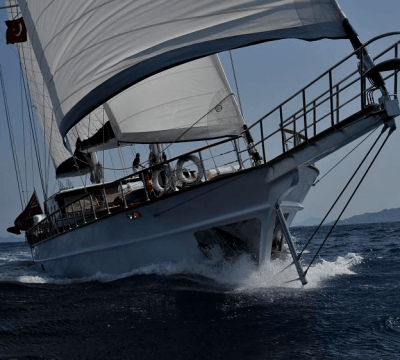 In the afternoon you could sail on to the Bay of Manastir with its Cleopatra and Hamam Bays. Maybe treat yourself to a Turkish Bath before returning to the yacht. 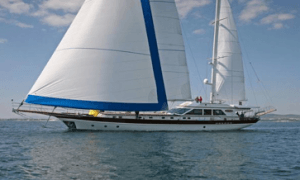 Agalimani – Gemelier, Gulf of Fethiye. 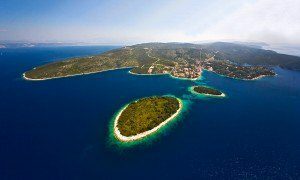 A swim and leisurely breakfast underway as you head for Gemiler Island (also known as St Nicholas Island as it is believed this is his final resting place). Swimming, snorkeling and watersports followed by lunch on deck. Then step into history as you wander among beautiful Byzantine ruins scattered all over the island and gaze on the partly revealed mosaic floors of the ancient churches. A covered walkway leads to the water’s edge and the sunset must be seen from the summit. Talk of what you have seen over a sumptuous dinner under the stars. Gemiler Island – Ruin Bay. Enjoy a morning’s sail to Ruin Bay in the Gulf of Fethiye where the ruins of a Byzantine monastery lie partly submerged below the sapphire waters. Wonderful to snorkel around them and picture the life that once took place just feet below you. This gorgeously quiet spot is perfect for a short hike up through the scented pines to yet more ancient architecture on the hills above. 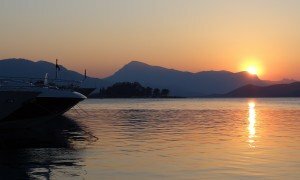 For those ready to take it easy, it may be time to enjoy all the facilities the yacht has to offer – whether it’s waterskiing, jetskiing, kayaking or a Jacuzzi on deck – or simply lying back and letting the crew spoil you with lavish cocktails, traditional Turkish tea or maybe a head massage (mmmn – so nice!) 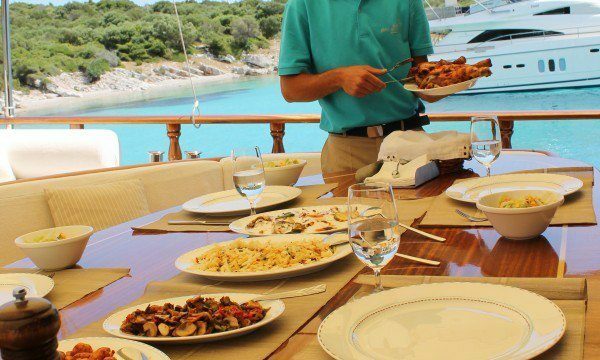 Dinner can be taken on board or at the sweet local restaurant ashore. Maybe a day to visit the City of Fethiye? For those still seeking yet more ancient culture there are the Lycian rock tombs of ancient Telmessos and for those ready to absorb a little shopping and try a little bargaining – there is more than enough here – in shops filled with precious carpets and rugs and beautiful antique jewelry and glass ‘objet d’arte’. The bubbly, cosmopolitan atmosphere will lure you to dine ashore on freshest seafood while watching the world go by and the bustling bars may encourage you to drink a little raki and dance until morning. There are a couple of good clubs here. Sail back past perfumed islands, across the bay to Gocek after breakfast and a refreshing dip in the ocean. Disembark in this enchanting little town before your short (20 minute) ride to the airport. Or… Just stay a little longer – ask us how else your trip could be arranged. 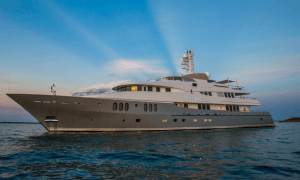 You could join the yacht in Bodrum and indulge your senses as you cruise the coast all the way to Gocek stopping for a night at the irresistible little Greek island of Simi on the way. The choices are endless. 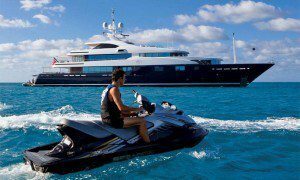 Your private yacht charter will be totally tailored around your wishes. Idyllic cruising on the Turquoise Coast. 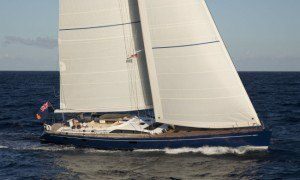 Get in touch with us now for individual advice on sailing itineraries and a bespoke choice of selected yachts to match your critieria. Our service is totally free to our charter clients.